Hello! Benjamin T. Dustbunny here again. The family is knee-deep in tissue paper and boxes, so I thought I'd post a little picture until Mom can get back on here! This is Anna's closet. 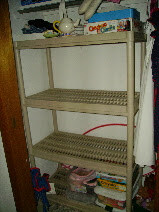 She emptied two shelves of her belongings into the hallway for next year's yard sale in anticipation of Christmas Day! Ah to receive like a child--with open arms and always room for more! That is so sweet and such a good reminder. You have a great blog here. I will be sure to visit often. Happy New Year.